What do they put in Harleys? and I own a Harley Davidson ElectraGlide, and the truth is that I think I may have become addicted to Harleys." Like all addicts, I knew there was a danger when I first started, but I had vowed this wouldnt happen to me. I would stay aloof and objective, I would ride other bikes, I could swap it if I wanted to. I was winning too, not for me the cheesy dealer T-shirts, no "Live to Ride" badges, no HD tattoos on my arm, no HOG back patches on my jacket. No sir, I may own a Harley, but that was as far as it went. Sure I liked it, polished it, fettled it, rode it, but I wasnt blinded by it. It was a love/hate thing, some days I really loved riding it, it would all just flow and I was cool with my Glide. Other days I would come home and ask myself why I was hanging on to this overweight, underpowered relic. Why the hell didnt I get myself a decent modern bike again. This was good, I was clearly a rational man still. 10 days ago I called into Alvins, the HD dealers in Edinburgh, simply cos their coffee machine is on free vend, and I needed a brew. Up the back of the shop was an intriguing little bike, one that I had only very rarely seen before, a Honda VRX 400 Roadster. I had been looking halfheartedly for an a second bike, something smaller and unfaired to partner the 'Glide, perhaps an older BMW Boxer or similar, but this looked just the ticket. Check the pictures, and tell me that this isnt one sensible little bike. 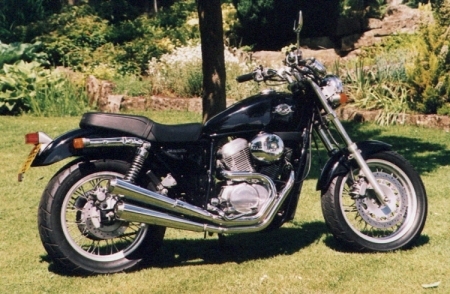 A V-twin, for all the world like a slightly shrunken Sportster, but being built by Honda it will be bullet proof too. The real clincher was that it was in virtually as new condition, a Japanese import it had never seen a salt strewn road, but easily half the price of and equivalent Sporty, or a decent old Bimmer boxer. On a pure whim, I bought it. I have had it a few days, and it is everything you would expect. It is indeed in fantastic condition, and is a very handsome little beast, and been much admired. The quality of finish is as good as the Harley, and noticeably better in some regards. It is not fast, but that is not an issue, cos I knew that when I bought it. It makes a V-twinish sort of sound, and it rides in a sort of Sportsterish fashion. I have ridden a number of Japanese copies of the classic American bike, and this is the best yet: tasteful, well made, good looking and great value. Sorted! So why am I less than ecstatic with my new toy? Why do I ride it and get off feeling that I havent really been riding a motorbike. Why does it taste like supermarket cola, rather than "Coke" , the real thing? Why do I find myself so lukewarm about it? The answer certainly isnt objective, Im going to have to plumb the subjective for this one. I think that four years of riding the Harley have left an indelible impression on me. It is on my hands where they touch the grips, on my feet where they sit on the footboards, and probably most importantly in the seat of my pants where I connect with the bike. Somehow all those vibes, and sounds, and spring tensions, and g-forces that make up the riding experience on a Harley have formed a pattern somewhere deep inside me. Get on anything remotely Harley-esque and the brain digs out this pro-forma for comparison. Ride a scooter or a rip-snorting sports bike and your subconscious looks for another reference point. But settle down in the saddle of anything remotely cruiser shaped, fire up a V-twin of whatever capacity, and that imprinted pattern gets dredged up from the cerebellum for reference. What does that T-shirt slogan say, "If I have to explain, you wouldnt understand"
well perhaps I do understand, and perhaps Ive just explained it to myself. I think Im coming to the conclusion that there is some ingredient in the make up of every Harley Davidson that is more than just the tubes and castings and wires. Honda and Yamaha and Kawasaki all produce bikes that are technically better products, but which dont have that ingredient. It is that ingredient that my little Honda, good bike though it is, is missing. The trouble is that that secret ingredient is some sort of narcotic. Through your hands and feet and seat of the pants it soaks into you. Get a fix often enough and you dont realise you have developed a habit, but try a fix of something not quite right, and your addiction starts to stare you in the face. Yeah I know, it has been painful for me to come up with this confession, and some of you are going to have to face it too sooner or later. Harleys may be crude, overpriced and under-developed, but they have got a barb in them that slowly works its way into you if you ride them long enough.